Buy the Farm . . . Share: Spring. Sprang. Sprung. Today was the first day I found that I could procure some decent spring vegetables at my local purveyor of fine produce. Early April, in New York State, does not generally yield an abundance of fruit and vegetables but there begins a slow trickle of items (not always from in state) that signal the beginning of spring. In the northeast late summer is the perfect season for getting excellent produce and also for turning me into a sweaty, complaining mess. We didn't get home until 8:00 PM so while Jen rested on the couch I put out these slices of rosemary bread with Kerrygold butter, sliced radish, salt, and pepper. After a couple of servings both of our lips (or sets of lips, we don't collectively share two lips) were tingling. 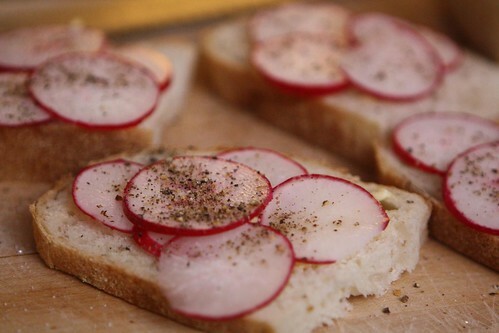 Much like with good arugula I consider this to be evidence of some mighty fine radishes. For the main course I cooked some crushed garlic, spring onion, red pepper, and shiitake mushrooms (from New Jersey) in a little olive oil and butter. When they were slightly softened I added some fresh ramps, cooked linguine, slat, and pepper. 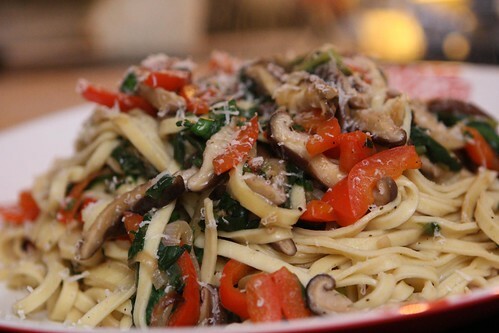 This made for a great light pasta dish for the season. 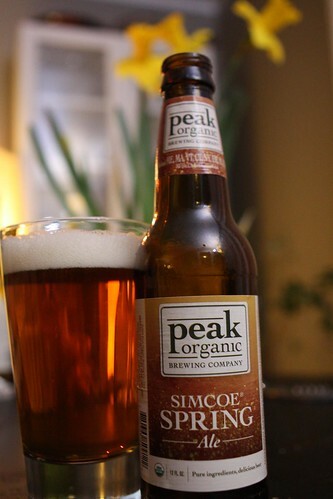 For beer I decided to try this Simcoe Spring Ale from Peak Organic Brewing Company in Portland, Maine. I think last year at this time I might not have liked this beer but after developing my beer palate for the last 365 days I found this highly enjoyable. It was not too bitter but had a nice flowery, piney taste from the Simcoe hops. It also had what I like to call the "Budweiser Exhale" which was detectable on the aftertaste. I'm thinking there must have been a hop used in this beer that is also used in Budweiser. This was also detectable in my home brew so it may be the Saaz hop. A quick Google search might even be able to give me an answer for this but that's an awful lot of work. You mean it IS the name of a great band. Come check us out next time you're in New York. We're playing small venues now but I fully expect to make the big time.